I have been developing the inversion analysis for, and managing the commercialization of, this APL-UW-developed electrical remote sensing instrument which measures profiles of water conductivity -- a proxy for salinity -- in estuarine environments. The Conductivity Profiler is an APL-developed instrument prototype for remotely observing estuarine salinity profiles via electromagnetic measurements. It was used repeatedly in the Columbia River estuary in conjunction with nearby CTD profiles as part of the Center for Coastal Margin Observation and Prediction program, which sponsored the instrument’s initial development. Regions of strong property gradients, such as those present at fronts of salinity intrusions into a marine estuary, are of vital importance to the ecology of the estuary as well as the quality of the drinking and irrigation water sourced from it. Previous technologies to observe a salt wedge are subject to difficulties with: point sensors that are not representative, maintaining sensors in strong current, bio-fouling and sedimentation, fish attack and floating and submerged debris, damage from fishing and vessels and vandalism, and costly sensors and batteries. 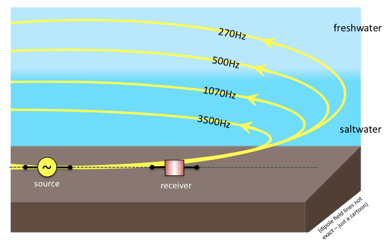 The instrument's principle of operation is that electromagnetic waves are attenuated in seawater as a function of frequency. Electrical currents at different frequencies are produced by the instrument, and the resulting electric field is measured at a nearby dipole receiver. These measurements can be combined to infer the conductivity (and hence salinity) structure in the water column. Conductivity is the variable of focus from this tool for sake of statistical rigor, but there is a nearly linear relationship to salinity in the estuarine environment, so we can measure conductivity to directly obtain salinity with low error. The instrument relies on the frequency dependence of the transmitted dipole electric fields - for highly conductive media (like salt water), there is a simple expression approximating the vertical distance at which the electric field amplitude has dropped to 1/e of the field amplitude at the source. This vertical distance is called the “skin depth” or “penetration depth”. The electric fields have a dipole shape; the yellow lines in the cartoon roughly depict the skin depths in 16m of water. The fields at different frequencies all sample the water conductivity profile with a weighting greatest at bottom, but decreasing with different height scales. While the highly-conductive assumption is less appropriate for high frequencies in fresh water, that’s alright because the higher frequencies are confined to the bottom where the denser salt water lies. Since the different frequencies “see” different depth spans in the water, the Conductivity Profiler can sense the gradient of an incoming salt wedge. In the two-panel figure we see electric field measurements at different frequencies responding to the different parts of the salinity gradient at different times. 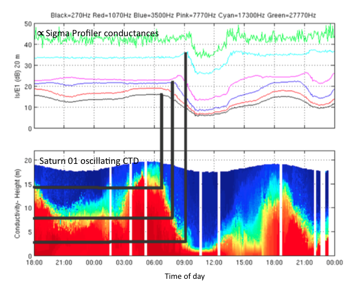 The colorful plot at bottom shows the conductivity as measured on the Saturn 01 profiling CTD mounted on nearby Astoria-Megler Bridge for comparison. The system has performed well in three developmental experiments with a prototype instrument, observing the flow of tidal salt wedges near the mouth of the Columbia River. It measures conductivity profiles in the water, which in the estuarine environments studied is nearly linearly related to salinity, so we can obtain salinity with low error. Preliminary results can be made to match conductivity profiles measured by co-located CTDs, with longer endurance and reliability than the mechanical CTD systems. Conductivity profiler results inherently smooth out smaller scale features such as boluses and internal waves. I am presently completing more rigorous statistical and inversion analysis of the prototype data to determine uncertainties and resolution limits of the results (to be published in a forthcoming academic paper) and set up a software platform to be used with future production versions of the instrument. For use in ecological applications we wish to build and deploy a new production-unit based on the in-line source/receiver prototype design, with affordability and reliability in mind, and with possible cabled connection for real-time data retrieval and power supply which would allow longer term deployment.